It was a time of great and exalting excitement. The country was up in arms, the war was on, in every breast burned the holy fire of patriotism; the drums were beating, the bands playing, the toy pistols popping, the bunched firecrackers hissing and spluttering; on every hand and far down the receding and fading spread of roofs and balconies a fluttering wilderness of flags flashed in the sun; daily the young volunteers marched down the wide avenue gay and fine in their new uniforms, the proud fathers and mothers and sisters and sweethearts cheering them with voices choked with happy emotion as they swung by; nightly the packed mass meetings listened, panting, to patriot oratory which stirred the deepest deeps of their hearts, and which they interrupted at briefest intervals with cyclones of applause, the tears running down their cheeks the while; in the churches the pastors preached devotion to flag and country, and invoked the God of Battles, beseeching His aid in our good cause in outpouring of fervid eloquence which moved every listener. It was indeed a glad and gracious time, and the half dozen rash spirits that ventured to disapprove of the war and cast a doubt upon its righteousness straightway got such a stern and angry warning that for their personal safety’s sake they quickly shrank out of sight and offended no more in that way. “God the all-terrible! Thou who ordainest! “You have heard your servant’s prayer — the uttered part of it. I am commissioned of God to put into words the other part of it — that part which the pastor — and also you in your hearts — fervently prayed silently. And ignorantly and unthinkingly? God grant that it was so! You heard these words: ‘Grant us the victory, O Lord our God!’ That is sufficient. The whole of the uttered prayer is compact into those pregnant words. Elaborations were not necessary. When you have prayed for victory you have prayed for many unmentioned results which follow victory — must follow it, cannot help but follow it. Upon the listening spirit of God the Father fell also the unspoken part of the prayer. He commandeth me to put it into words. Listen! About the Text: According to Albert Bigelow Paine, whom Twain named as his literary executor not long before he died, Twain dictated “The War Prayer” in 1904-05 and intended it to be published then. However, it was rejected by his publisher. 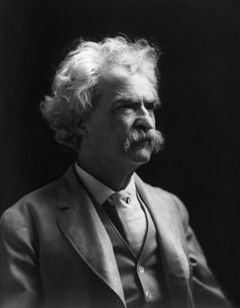 Paine found it among Twain’s unpublished manuscripts after the writer’s death in 1910. Paine published the essay for the first time in 1923 in his collection, Europe and Elsewhere. The text I present here follows Paine’s 1923 text. The preceding was shared with me by my good friend David Wilke. Still makes a man pause and think, particularly an American man, a citizen of a nation that is more prone to go to war than any other nation in the world! Blessed are the Peacemakers! This should be required reading by all. It should be read in the White House, and in the Houses of Congress. It should be read the world over. John, as always, thanks. And thanks to David. … Maybe a little more wisdom and prudence is not too much to ask for from those who would seek to be our leaders. but you know those silly SOBs better than I do. We can ask for wisdom and prudence, but those are meaningless concepts nowadays, won’t sell to a convenience-oriented majority. And it should be read in our Parliament of Australia. We who will follow America (“a nation that is more prone to go to war than any other nation in the world” ) into each and every war you go to. So many prayers are like that. If only more of us would heed the lunatics urging us to stop and think of the consequences of what we ask for. We need good old Sam Clemens more than ever these days. Thanks for sharing the good stuff, John. And as my Canadian friend has reminded me, the USA has a year of presidential campaigning yet to endure, where as theirs is only six weeks long and ends on October 19th.